Many thanks to Tim Smith from the Observer & Eccentric Media for the great write-up on Sunshine's Football Clinic. ​Thank you to Megan at WDIV Local 4 News for the tremendous story on Sunshine's Football Clinic. Please check it out! Thank you to Tim Smith from the Observer & Eccentric Media for writing a great article leading up to the 4th Annual Sunshine's Football Clinic. ​Check out the article here. ​Thank you to Saba Mangla from 88.1 The Park Radio for interviewing Connor about the upcoming football clinic. 88.1 The Park Radio is the student-operated radio station owned by the Plymouth-Canton Community Schools. We appreciate their support! ​Listen to the interview here. July 23, 2016: Sunshine's Football Clinic in Frankenmuth took place Friday, July 22, and it was AWESOME! Participants enjoyed completing a variety of non-contact football drills, hanging with their buddies, and everyone's favorite part: breaking through their very own personalized paper banner! Many, many thanks to Glenda Berg, the Director of the Clinic, the entire Frankenmuth Football program, and all the volunteers for your efforts in putting together a perfect clinic. We couldn't be more proud of each and every one of you! Check out this video to see just how much fun was had by all. 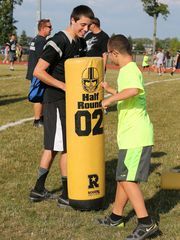 July 15, 2016: As we gear up for our 3rd annual football clinic, Tim Smith, Plymouth-Canton Sports Editor for the Observer & Eccentric newspaper, wrote a great reflection article on Sunshine's Football Clinic, which includes quotes from Connor and Coach Rochon. Also included are a few action shots of some of the participants showing off their mad football skills. May 4, 2016: Connor and Melanie Gray, who was his 4th grade teacher, were delighted to be the guest speakers at a recent Kiwanis Club of Plymouth meeting. They enjoyed sharing background information on Sunshine’s Football Clinic, including how Connor first came up with the idea for the clinic in 2014 when Mrs. Gray introduced Genius Hour in her classroom. They also shared how Coach Brian Rochon quickly responded to Connor’s email request and offered the assistance of the Plymouth Wildcats football coaches and players to help make Connor’s project a reality. With this week being Teacher Appreciation Week, and both Melanie and Brian being teachers in the P-CCS District, we would like to thank them, and all the educators, who “plant the seed” and inspire and empower your students to not let their age or inexperience stand in the way of making a difference. January 25, 2015: Thank you very much to everyone who participated in our Dining for Dollars fundraiser at Palermo Pizzeria and Restaurant on January 25, 2016. The restaurant was PACKED the entire evening with teachers, coaches, students and families from throughout our community. The owner of Palermo’s was astonished by the community’s support and indicated that it was the restaurant’s most well-attended fundraiser since they first opened their doors in 1981. We would like to send a huge thank you to the members of Woman’s Life Society- Chicks for Charity for not only organizing and participating in the fundraiser, but also generously donating $500 to Sunshine’s Football Clinic. We are tremendously thankful for the support they have given to the football clinic. Two years ago when Connor was a nine-year-old sitting in Mrs. Gray’s fourth grade classroom he came up with the idea to hold a football clinic for children with special needs during a class assignment. He hopped off the bus and proudly informed us of his project idea and innocently proclaimed, “It will be easy!” While it wasn't expressed aloud, in my mind the chances of his project coming to fruition immediately fell into the “slim-to-none" category. Every week he brought home something new he created for his project - the timetable… the list of companies to contact for donations… the drills participants would do… the handmade signs he created to promote the football clinic… He wasn’t giving up on his ambitious project idea, and Mrs. Gray and I agreed that we should assist him with his goal of making the football clinic happen. From the very first email we sent to the Plymouth Wildcats Football Program, I quickly realized one thing: I was wrong and Connor was right. It was easy. Almost immediately Coach Rochon replied that the Wildcats coaches and players would help us run the clinic. After that, the positive support we received from family, friends, local businesses, the school district, etc. continued to make the football clinic a breeze to plan. Seeing the large turnout at the fundraiser and knowing everyone was there to support a project that Connor strongly believed in from the start was overwhelming. Thank you! Your donation will assist us in putting together another awesome football clinic for an amazing group of children. 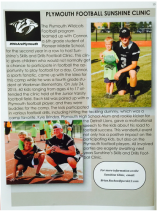 Fall, 2015: Thank you to the P-CCS Alumni Association Magazine, Thrive, for featuring an article on Sunshine's Skills and Drills Football Clinic in the Fall 2015 Athletic Edition, Volume II. We appreciate the support from the P-CCS community! July 27, 2015: Tim Smith, Plymouth-Canton Sports Editor for the Observer & Eccentric newspaper, wrote an awesome article on Sunshine's Football Clinic, including quotes from the participants and Plymouth Wildcats football players on what our football clinic meant to them. The article includes LOTS of great photos of our incredible participants who showed everyone at the clinic the true meaning of teamwork and sportsmanship. On October 24, 2014 during Plymouth's last regular game of the season, Connor was honored during half-time as the Wildcat Hero of the Week. Former Plymouth football player Kyle Brindza presented Connor with a game jersey and a signed football by the entire team. Connor even got to stand in as an honorary captain during the coin toss! Many thanks to the Plymouth Wildcats Football Booster Club for honoring Connor with this very special award. On September 28, 2014 during a Detroit Tigers pre-game ceremony, Connor was selected as the recipient of the PAWs for Applause award, which honors a youth who volunteers their time and resources to make the community a better place. Detroit Tigers mascot, Paws, presented the award to Connor at home plate. The presentation was shown on the jumbotron for everyone at Comerica Park to see! Many thanks to Cheryl and her son Tony, who attended the clinic, for nominating Connor for the Paws for Applause award. It was an incredible experience that Connor will never forget! Please click here to read an article on the ceremony written by Choya Jordan from the Observer & Eccentric. Please click on the Observer & Eccentric articles below to read more about the football clinic. Thank you to Tim Smith, Plymouth-Canton Sports Editor, for capturing the magic of the evening and sharing it with his readers. © 2019 Sunshine's Skills and Drills Free Football Clinic for Kids with Special Needs. All rights reserved.